Within a member's contact record, membership details appear on the Membership tab. From here, you can click the Edit button to edit the member's membership information or group participation. You can also click Renew or Suspend to renew or suspend their membership. If the contact is not yet a member, you can click the Assign membership button to assign a membership level and make the contact a member. Membership fields are custom fields that you have added to your Wild Apricot database. Membership fields also appear on your membership application form, and can be restricted to specific membership levels. From the Membership tab of a member's contact record, you can modify various membership details. 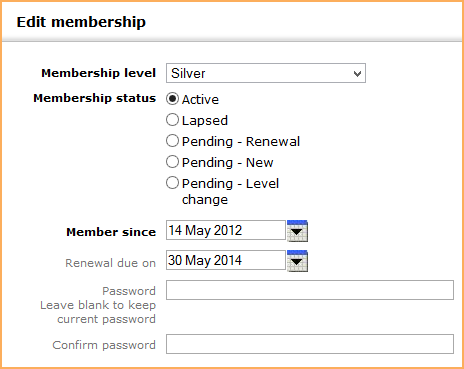 To modify membership details, click the Edit button within the Membership section of the Membership tab. From the Edit membership screen, you can update the level, status, renewal date, password, membership fields, and member group participation. Only bundle administrators can change the status of a bundle membership. To modify only member group participation, click the Edit button within the Group participation section. To manually renew a member's membership, click the Renew button. Activate without invoice – activates the membership renewal without generating an invoice or adding to the member's outstanding balance. Choose this option if this member has already paid and/or you do not want to track this transaction in Wild Apricot. Generate invoice – generates an invoice for the membership renewal. The member can then pay the invoice online through their profile or by using an offline payment method (e.g. cash, check). Cancel – cancels the membership renewal. If the membership level is free, you will be asked to confirm the renewal. Members can also renew their membership themselves from their profile page. You may wish to suspend someone's membership because of an overdue renewal payment or some other reason. You can also suspend a member to convert the member into a contact. To suspend a member, click the Suspend button within the Membership tab. If, at a later date, you wish to reinstate the contact as a member, you can click on the Resume button within their membership tab. This will reactivate them to their previous membership level with all their details intact.